Over 100 representatives from businesses around Moray came together to celebrate local achievements at the Moray Chamber of Commerce Annual Awards Lunch on Wednesday 16th November at The Stotfield Hotel in Lossiemouth. Held during a busy programme of events for Moray Business Week, the Awards Lunch was an excellent way to celebrate the best business talent in Moray. The first award was the Most Promising Enterprise Award sponsored by Business Gateway. The winner of this year’s award is I Like Birds, who have recently been appointed to JELC, an exclusive licensing agent who represent organisations such as Pepsi and The National Gallery. I Like Birds have already received recognition for their designs in a number of categories; however JELC will work closely with the business to roll out their artwork further across the UK and internationally. Due to the range and quality of businesses that applied for the award, the judges felt that Rosevalley Kennels and Cattery’s commitment to customer satisfaction was worthy of recognition therefore they were awarded a Highly Commended Award. The second award of the day was SME of the Year. Sponsored by Johnston Carmichael Chartered Accountants and Business Advisors, it was AES Ltd that scooped the prize. AES Solar is an independent company who have been operational for over 35 years. They were the first solar manufacturer in Western Europe and the business continues to put the customer first whilst looking to make changes to reduce the environmental impact of their processes. The first of the Tourism Awards was the Moray Speyside Tourism Business Award, sponsored by Moray College. 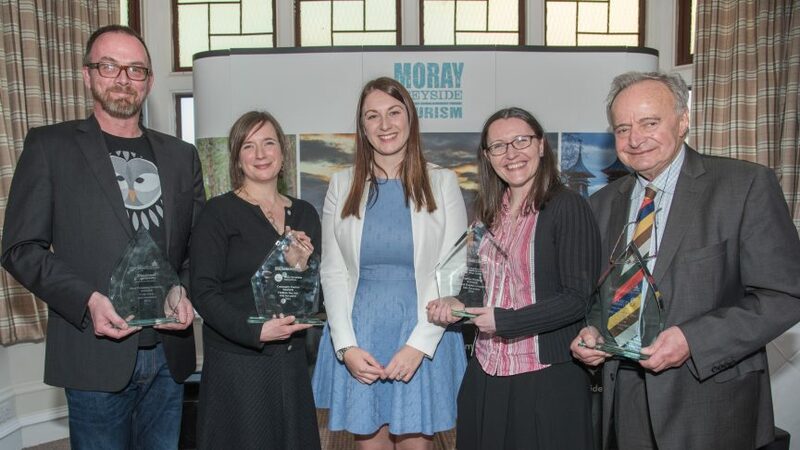 The winner of this year’s Moray Speyside Tourism Business Award was the WDCS Whale and Dolphin Centre at Spey Bay, a 4* Visit Scotland attraction that welcomes 90,000 visitors a year hoping to catch a glimpse of the Moray Firth’s bottlenose dolphins. Following this, a Community Tourism Commendation was awarded to Stan Barber from Morayvia. This was in recognition of their rising visitor numbers and 4* Award from Visit Scotland. The second Tourism Award and final award of the day was the Community Tourism Award sponsored by Bruce Stevenson Insurance Brokers. The winner of this award was Findhorn Bay Arts for their involvement of volunteers and their community and industry engagement. After a two course lunch, guests heard from speaker Jill Brown, owner of Berry Good. Jill has recently relocated from Caithness to Elgin to expand the business and is proudly making her fruit infused spirits here in Moray. We aim to hold this event once again, during Moray Business Week in 2017.